Mid-Life Cruising!!! : A New Salon Table! 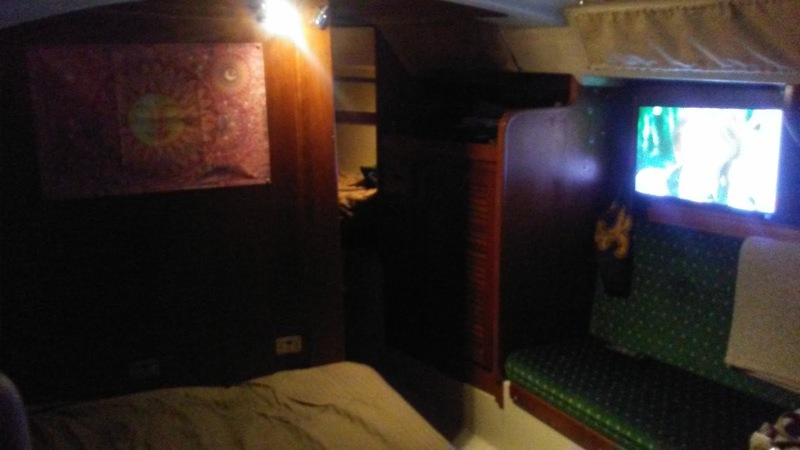 Since moving aboard Nirvana last year, Ken & I had been living without a salon table. We had a salon table, but it had been in storage while working on Nirvana's interior teak and other projects. After returning from our 3-month insurance adjusting adventure this past December, we decided that it was finally time to pull our table out of storage. 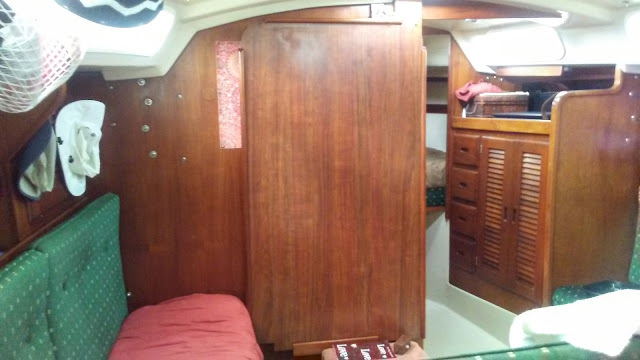 While we were looking forward to having a place to eat a good meal, we weren't looking forward to the hanging such an ugly table on our beautifully restored teak bulkhead! You see, for some reason Catalina had been using the most awful veneer on their salon & navigation tables .. so fake & yellow! I had looked into covering our table with fabric or artwork and then coating in epoxy, but that wasn't gonna be cheap. With so many other more important projects on our list to do, we accepted the fact that we were gonna live with an ugly table in our salon .. at least for a year or two. 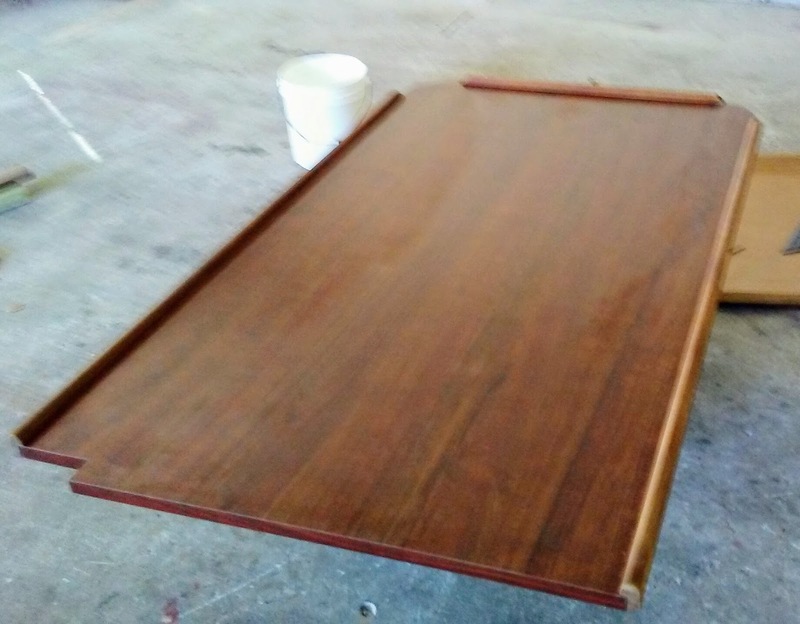 Here's a photo taken before our table went into storage .. and before the teak was restored. This picture makes the teak look much better than it really did (see more before pics here), but you get the idea of how fake our table looked! When I watched Ken grab our table from our storage shed, I watched pieces of the table fall off the bottom of the table! Yep, not only was this table ugly .. it was junk! Evidently, the table soaked up moisture from the concrete floor and it started to disintegrate. We weren't gonna be able to use this table after all. We were gonna have to get a new one .. can't say we were disappointed! 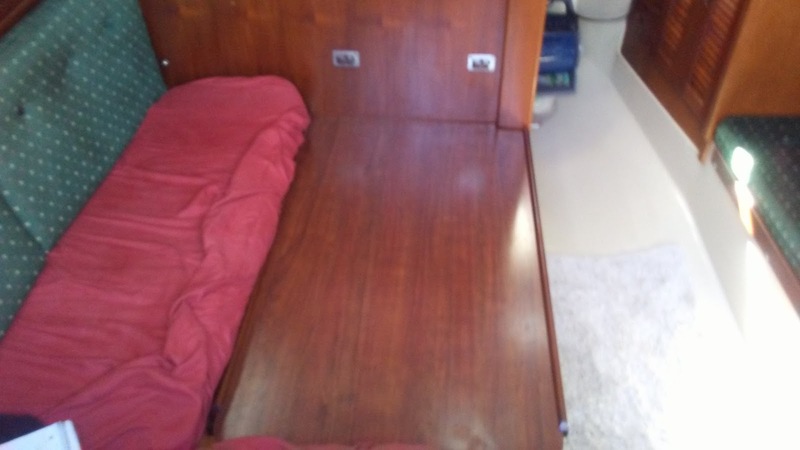 Ken had the brilliant idea of calling a local cabinet & counter-top guy, who said he could make us a new table out of marine plywood covered with counter-top laminate .. for about $150 bucks! 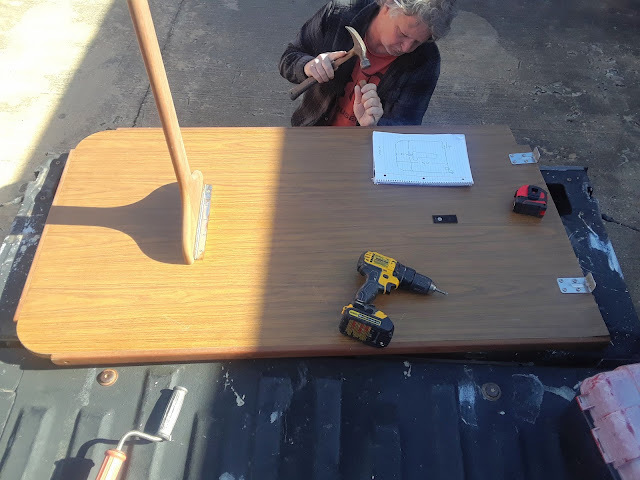 So, Ken removed the table's leg and trim, sketched the table with its measurements, then brought the old table to the counter-top guy. 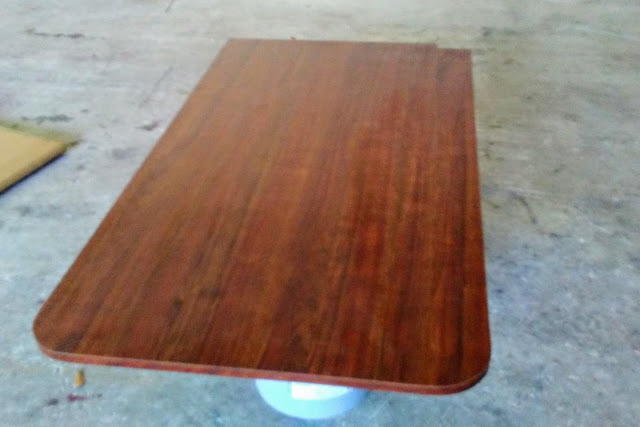 We chose some cheap, white matte counter-top that the guy had lying around for the back of the table, and a nice "faux teak" laminate with a reddish tint for the top of the table in a satin finish that is scratch-resistant. After about a week, we picked up our new table! This isn't the best photo, but we were really happy with the look of our new table. 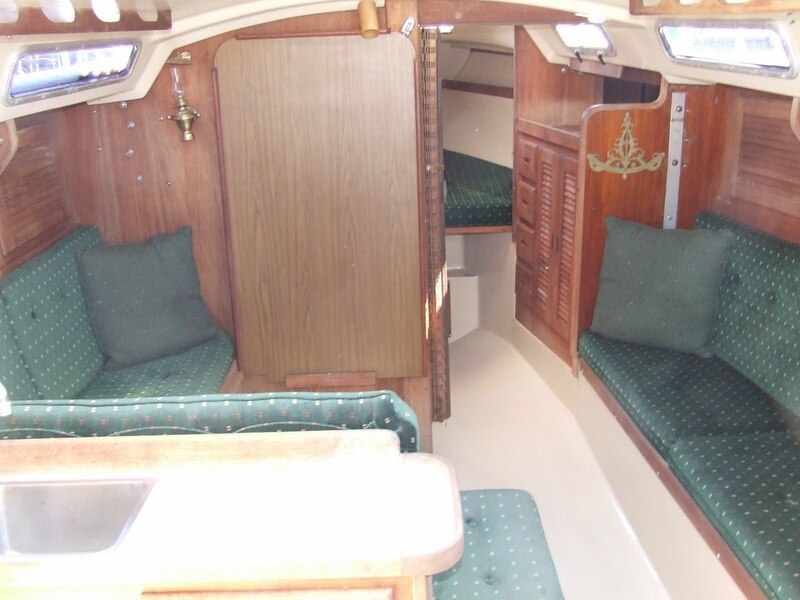 It looked like real teak .. not that fake stuff we had before! 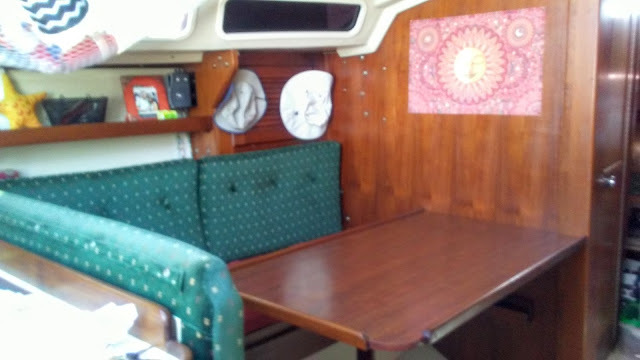 After hanging our new salon table on our bulkhead, I think we did a pretty good job matching our restored teak interior! Our new table blends right in and is much lighter than our ole hunk of junk. I'm so glad that our original table fell apart! 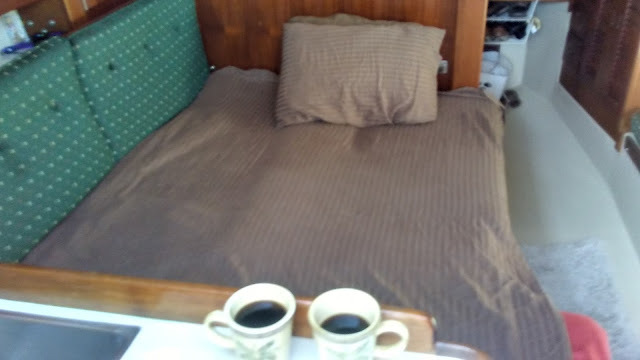 We've had our new table since February, and we've been enjoying having a place to eat a meal in comfort. We still eat a fair amount of meals without the table, but when we cook a good meal or have guests over for dinner .. we don't wanna have to use our laps. Our daughter and son-in-law have come over for a few meals, and all four of us fit comfortably .. and I wasn't embarrassed to be eating on such an ugly table! Not only can we eat on the table, but it can also be lowered down to our settee's level and turned into a full-sized bed! 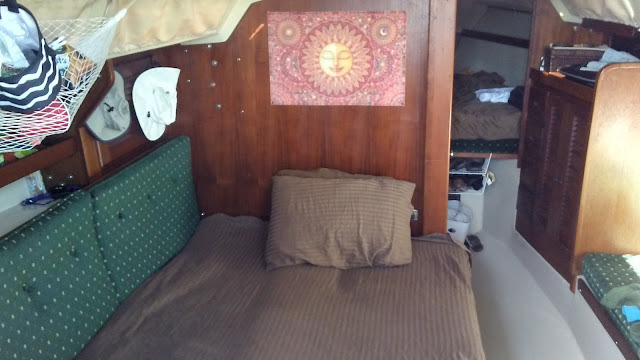 Our old table served this purpose as well, so we just add the cushions that are made for this purpose (one looks like a pillow, one snaps on the side of our aft-cabin, and the other usually stays on the side of our v-verth), add some sheets and we have a bed! When it's raining or Ken & I just wanna lounge around, we just turn the salon area into a lounging area .. perfect place to read a book or watch television. Sometimes we never make it to the v-berth for the night! Not a bad place to enjoy a cup of coffee in the morning! 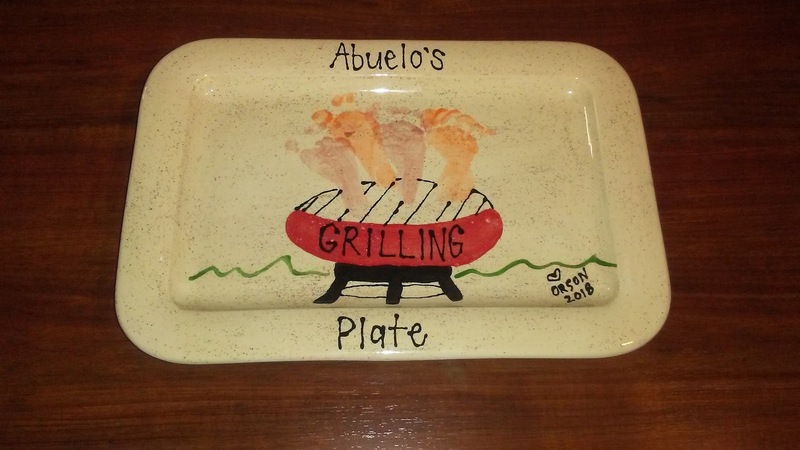 On Father's Day, Ken received a ceramic "grill plate" that our daughter painted .. with our grandson's footprints as the flames! We love it, and it looks great on our new table. The colors are perfect! It took me six months to finally write about our new table, and I've got so much more to catch up on! 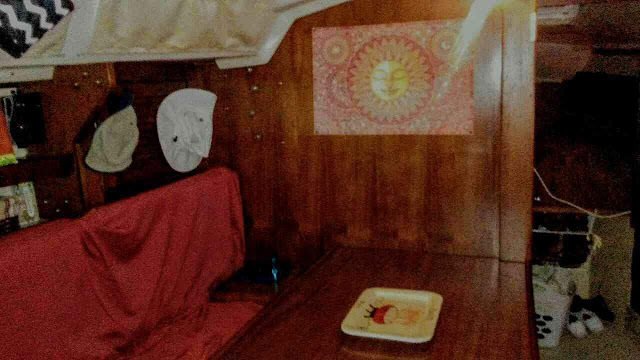 Shortly after installing our table, we sewed & installed curtains, then sailed to Mexico, came back and tackled our propane project, and have been in project mode ever since. We did sneak in another adventure last month, but we also knocked out a couple more projects so stay tuned. I have more projects to write about .. and we have more projects to tackle!